Click photo to watch Rep. Kiffmeyer's reasoning on why an Iowa drivers license qualifies to vote in Minnesota. Under a proposed voter photo ID constitutional amendment, a student from Iowa living in Minnesota would be able to use their Iowa drivers license without a Minnesota address to vote in Minnesota, while a Minnesota student attending a private university in Minnesota would not be able to use their student ID, even if it has their current address on it. 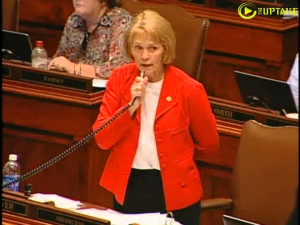 That was one of the revelations from voter photo ID author Representative Mary Kiffmeyer (R- Big Lake) during a more than nine hour debate that approved her bill along party lines 72-62. The Iowa drivers license qualifies to vote in Minnesota because it is both “valid” and is “government issued.” The student ID for a private school would not qualify because the government didn’t issue it. The student from Iowa would need to now live in Minnesota and be at least 18 years old. The Senate is considering a slightly different version of the voter photo ID bill and could vote on it as early as Friday. If what the Senate passes remains different than the House, it will need to go to a conference committee. The bill would not need Governor Mark Dayton’s signature to appear on the fall ballot. Republicans are passing voter photo ID as a constitutional amendment instead of a law since the Democratic Minnesota Governor vetoed similar legislation last year and Republicans did not have enough votes to override his veto. Minnesota voted down a constitutional amendment that would have made it harder for people to vote, but newly empowered Senate Republicans are considering a "voter ID" law. A proposal to legally allow early voting in Minnesota is being called "unconstitutional" by those who led last year's unsuccessful attempt to restrict voting through a "photo ID" constitutional amendment.